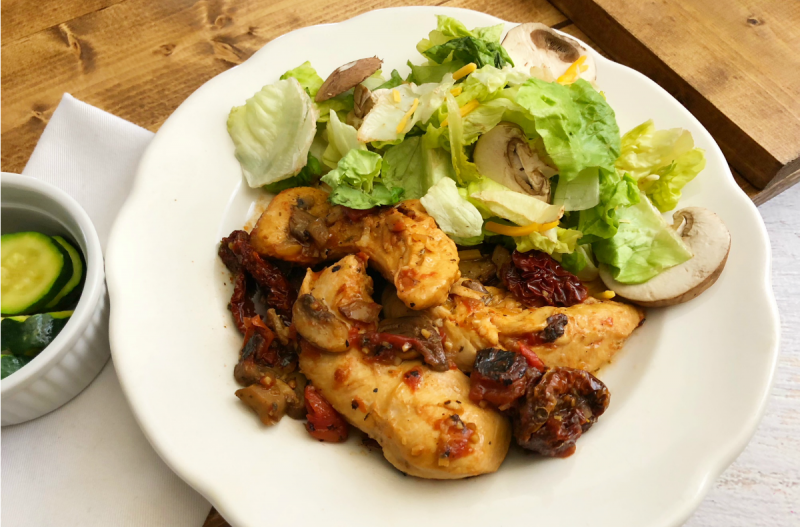 Amazing combo of Italian flavors in this easy chicken skillet meal. Freeze all the ingredients together and then cook in a large skillet or saucepan...and voila...dinner is ready in less than 20 minutes! Enjoy! Slice the zucchini into 1/2-inch circles. In a large skillet, add the olive oil, balsamic vinegar, Italian seasoning, minced onion, minced garlic, zucchini, white mushrooms and chicken tenderloins and saute together for 2 to 3 minutes. Stir in the diced tomatoes, sun-dried tomatoes and chicken stock and bring to bubbling. Reduce heat to low and let simmer for 7 to 10 minutes, or until chicken is cooked through and veggies are softened. 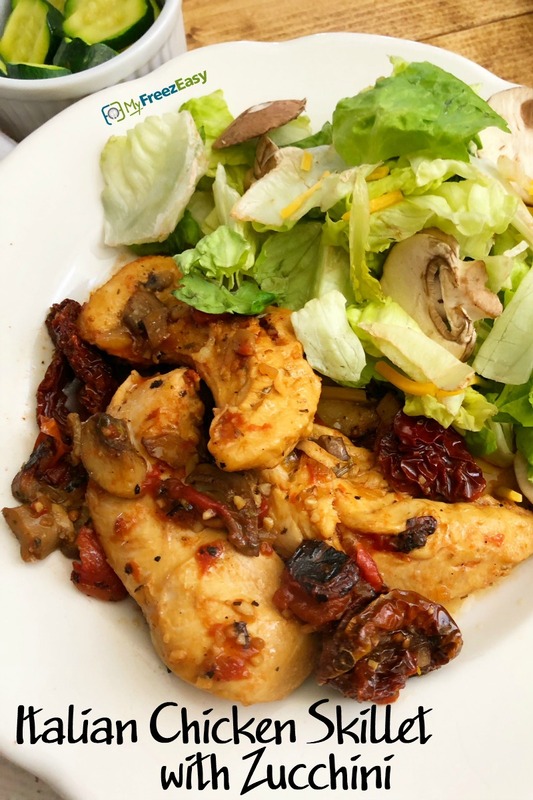 Serve Italian Chicken Skillet with Zucchini with Parmesan cheese garnish and side salad. Slice 2 zucchini into 1/2-inch circles. Put baggie in the freezer and freeze up to 6 months in fridge freezer or 12 months in a deep freezer. Thaw in the fridge overnight, or a warm bowl of water for about 20 minutes. Transfer all of the ingredients from the freezer bag to large skillet or saucepan, start to cook over medium heat until bubbling, then reduce heat and simmer for 10 minutes or until chicken is cooked and veggies are softened. Thaw and add all of the ingredients from the freezer bag to large skillet or saucepan, cook over medium heat until bubbling, then reduce heat and simmer for 10 minutes or until chicken is cooked and veggies are softened. Serve with Parmesan cheese garnish and side salad.